If your outdoor area has limited space or you want the joy of a swimming pool or soaking in a hot tub without the hassle and overwhelming task of installing one in-ground a swim spa might be right for you! First we need to answer the question what are the benefits of a swim spa? A swim spa is a rectangular shaped spa that allows you to continuously swim against a current provided by built-in jets. This eliminates the need for turning around after each lap like in a regular pool. If you are an avid swimmer the ‘unlimited laps’ you can swim in a swim spa is a major bonus when it comes to exercise. Not to mention, it’s smaller size takes up less space in your yard and is cheaper and easier to maintain than a full size pool. Water therapy, also referred to as hydrotherapy or aquatic therapy, is a great way to to aide in the body’s recovery from pain or injury. This form of therapy is most helpful for sufferers of chronic aches and pains caused by arthritis and/or other conditions, improves flexibility and movement, and relaxes muscles and soothes joints. Often people can enjoy movement in the water that they couldn’t do without pain on land. Swim spas come in a wide variety of sizes with or without added options. This is beneficial when thinking about the size of your outdoor space and the options that best suit you. They can be cold water, hot water or hot/cold combo. This gives options for varying weather temperatures in your area. One option that provides the best relaxation element for your body is salt water tubs. Salt water spas are a great way to increase muscle relaxation and also provide a reduced chemical route for pool sanitation. Swim spas can also be above ground, in-ground, or built into a deck. These options provide versatility when or if you have an issue with available space. So, whether you are an avid swimmer or just looking for a space saving way to get some exercise and have a relaxing soak, a swim spa might be the perfect choice for you. 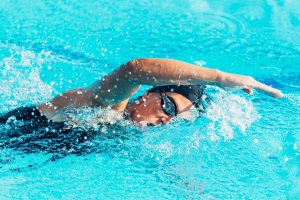 Swimming is a great way to get some low impact exercise and if you can turn your exercise space into a nice place to destress as well it’s proof there are some great uses for this backyard addition.